MATTHEW SHEPARD TO BE INTERRED AT WASHINGTON NATIONAL CATHEDRAL: Two decades after he was murdered in an anti-gay crime, Matthew Shepard will be interred at Washington National Cathedral on Oct. 26 following a service of thanksgiving and remembrance. The service will be presided over by the Right Rev. Mariann Edgar Budde, Episcopal Bishop of Washington, and the Right Rev. V. Gene Robinson, the first openly gay priest to be consecrated a bishop in the Episcopal Church. “We’ve given much thought to Matt’s final resting place, and we found the Washington National Cathedral is an ideal choice, as Matt loved the Episcopal church and felt welcomed by his church in Wyoming,” said Judy Shepard, Matthew’s mother. “For the past 20 years, we have shared Matt’s story with the world. It’s reassuring to know he now will rest in a sacred spot where folks can come to reflect on creating a safer, kinder world.” Matthew Shepard died on Oct. 12, 1998. More from the New York Times and the National Cathedral. Read Judy Shepard’s letter to young advocates across the country who are igniting change in the world in Out Magazine. HRC CELEBRATES 30TH ANNUAL NATIONAL COMING OUT DAY: “Coming out can be one of the most courageous acts an LGBTQ person makes, and that courage is inextricably tied to our continued progress toward full equality,” said HRC President Chad Griffin. “Visibility matters, and research shows that when people know someone who is LGBTQ, they are far more likely to support full equality under the law. 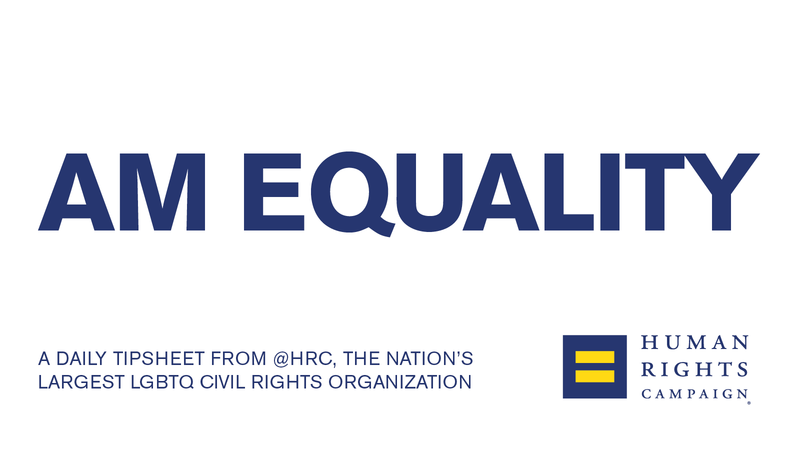 Coming out and sharing our stories is essential to advancing LGBTQ equality and fighting back against attempts to turn back the clock on our progress.” HRC worked with Twitter to mark the occasion with a dedicated National Coming Out Day emoji in conjunction with the hashtag #ComingOutDay. Stephanie Beatriz — an actress, proud Argentinian American immigrant, and bisexual woman — will also join @HRC today for an #HRCTwitterTakeover. Read more from HRC. Facebook added a “came out” life event to celebrate National Coming Out Day. More from Gay Star News. On this day, HRC President Chad Griffin remembers his dad, and the coming out letter he never gave him. Read about it in the Los Angeles Times. HRC NAMES NICOLE COZIER AS SENIOR VICE PRESIDENT FOR DIVERSITY, EQUITY AND INCLUSION: “I'm extraordinarily proud to announce that Nicole Cozier has been promoted to Senior Vice President of Diversity, Equity and Inclusion and will join HRC’s senior leadership team,” said HRC President Chad Griffin. “This is an organizational and structural shift I feel is crucially important to ensuring that a diversity, equity and inclusion lens is brought to every major organizational decision we make. Nicole has been a key leader in pushing our organization forward and making progress, and her perspective and advice has been invaluable to me over the last two years.” Cozier previously served as HRC’s Director of Diversity and Inclusion and brings more than two decades of non-profit experience to her role. Read more at HRC. WHAT THE TRUMP & BARLETTA ANTI-LGBTQ AGENDA MEANS FOR PENNSYLVANIA: “Donald Trump, Lou Barletta and their anti-LGBTQ agendas are wrong and politically toxic for Pennsylvania,” said Campaign Director Geoff Wetrosky. “Both continue to stand on the wrong side of history, consistently undermining efforts to advance equality and protect the LGBTQ community, in a state with more than 2.3 million Equality Voters. With less than 30 days from the crucial midterm elections, HRC is on the ground mobilizing our hundreds of thousands of members and supporters in Pennsylvania to reject the politics of hate and re-elect pro-equality champion Bob Casey to the U.S. Senate.” More from HRC. Trump is campaigning for senate candidate Lou Barletta yet again. MIKE PENCE AND SCOTT WALKER JOIN ANTI-LGBTQ FORCES FOR CAMPAIGN IN WISCONSIN: “Mike Pence and Scott Walker’s extremist, discriminatory agendas pose a threat to Wisconsin and the nation,” said HRC Wisconsin State Director Wendy Strout. “From their opposition to marriage equality to their efforts to license discrimination against LGBTQ people, they do not represent Wisconsin values and our state’s more than 560,000 Equality Voters. With less than 30 days until the crucial midterm elections, HRC is mobilizing its hundreds of thousands of members and supporters in Wisconsin to reject the politics of hate and elect a pro-equality Governor in November.” More from HRC. HRC ENDORSES BEN JEALOUS FOR MARYLAND GOVERNOR: “Ben Jealous is a proven leader with the vision and commitment needed to continue moving Maryland forward as a welcoming and inclusive state,” said HRC President Chad Griffin. “As a longtime civil rights champion, Ben is passionately committed to putting people over politics and fighting to expand and protect the civil rights of every individual.” More from HRC. THANKFUL THURSDAY -- BROOKINGS, S.D., CELEBRATES ITS 100 MEI SCORE: Yesterday, Brookings, S.D., Mayor Keith Corbett joined HRC to launch its national 2018 Municipal Equality Index (MEI) and honor the city’s perfect score. Brookings is the first city in South Dakota to score 100, and was designated an “All-Star” city for earning over 85 points on the 2018 MEI -- despite hailing from a state without LGBTQ-inclusive statewide non-discrimination laws. Read more from KSFY, and more on the MEI here. 1/ @realDonaldTrump wrote in a @USAToday oped that as the Republican presidential candidate, he promised that he "would protect coverage for patients with pre-existing conditions and create new health care insurance options that would lower premiums." FOR SECOND YEAR, KOSOVO HOLDS LGBTQ PRIDE EVENT WITHOUT INCIDENT: More from The Associated Press. SRI LANKAN STUDENT THREATENED WITH EXPULSION BECAUSE SHE WORE PANTS, DISPLAYED PRIDE FLAG: More from Gay Star News.